Photo by Scott McCloskey Construction continues on a new footbridge near Wheeling Jesuit University. The span will replace one the city closed about a year ago due to its deteriorated condition. 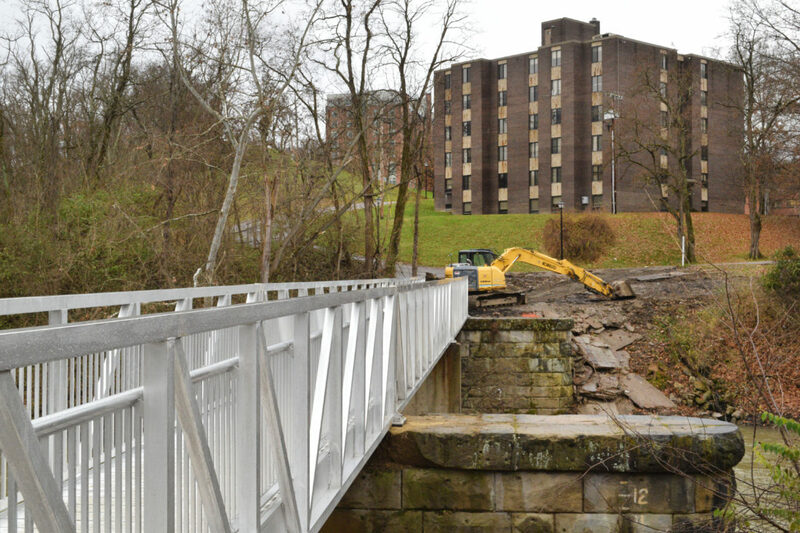 As construction continues on the new footbridge near Wheeling Jesuit University, Wheeling City Council took steps to finalize funding for the project at its meeting Tuesday. 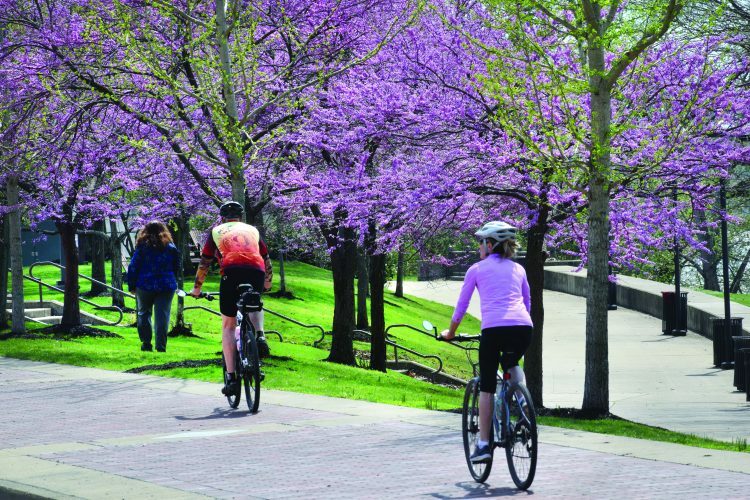 Council passed an ordinance authorizing the city to spend about $96,400 through the Community Foundation for the Upper Ohio Valley on the footbridge project. The project is the result of a $170,000 anonymous donation. The foundation has received $95,000 from the donor already and will receive the remaining money at the start of next year, City Manager Robert Herron said. The total cost of the bridge will be around $182,000 to $183,000, Herron said, and reimbursement will occur during the first week of January. The city expects the bridge to be finished by the end of the year. “The cost of this bridge, the vast majority of this, is going to be reimbursed by the donor,” Mayor Glenn Elliott said. The nearly-built aluminum footbridge connects Locust Avenue to Currie Drive at the entrance to Wheeling Jesuit University in the Woodsdale-Pleasanton area. It replaced an older bridge that the city closed in December of 2017 because it was in poor condition. The anonymous donation for the new footbridge was announced at council’s Nov. 20 meeting. “I’d just like to publicly thank once again the private donor who made a sizable, sizable contribution,” Councilwoman Wendy Scatterday said at Tuesday’s meeting. Although the new bridge is mostly constructed, ramps still need to be installed so that it is compliant with the Americans with Disabilities Act, Herron said. “On behalf of the entire community, a lot of gratitude to the city manager and city staff for helping that project come to fruition on a really quick timeframe,” Scatterday said.